The design and analysis of chemical and metallurgical processes starts with an assessment of process feasibility. 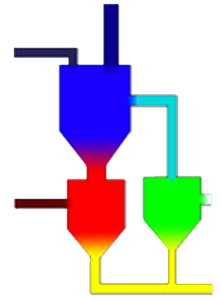 THERMART software provides powerful and cost-effective spreadsheet-based tools for the scientist, engineer and student for evaluating the thermodynamic basis of process feasibility. The principles for doing this are covered in detail in a recently-published Handbook, and summarized in a Basic Flowsheeting Principles e-book. FREED: Addition of more organic species, and correction of minor errors. THERBAL: Redesign for Excel 2007 and later; update user interface; simplify non-ideal solution models; allow user to set volume. BurnerCalc: Integrate Multicalc and Multigoal; develop a version using AES units; Add AFT feature. Outreach activity: Develop material for use in short courses, seminars, and webinars.